Wife calls me a salad nut and that I should change the name of my website into saladglory or something similar but the truth is, she’s enjoying them as much as I do. I guess somebody has to cook something else but pasta and casseroles in this household anyway, might as well be me. 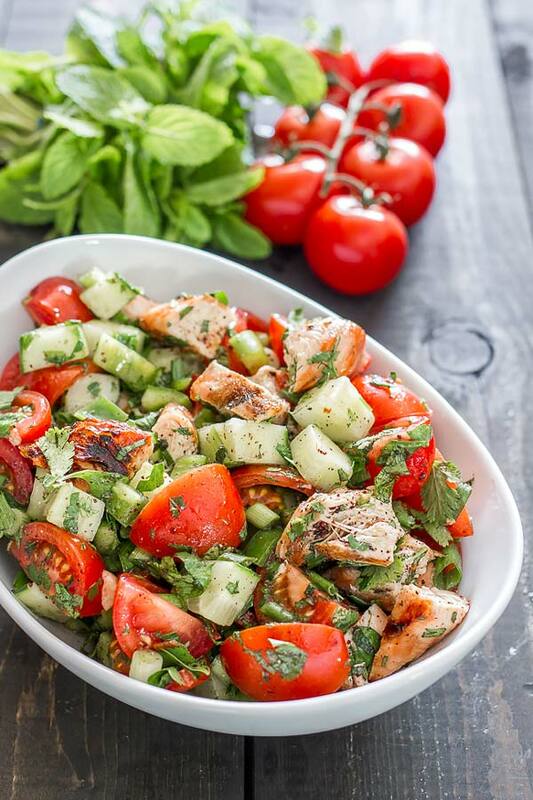 If you are looking for a classic fattoush recipe, this is not it. The original requires pieces of pita bread and a bunch of various veggies, no meat involved. WHAAAAAAAAAAAAAAAAT! Well, that didn’t work for me so I got rid of the bread and added some grilled chicken. As usually, my salads are amazing (ask the wife). One thing that I had trouble finding was sumac , a spice that adds a lemony taste to this dish, pretty much mandatory to any fattoush recipe. Make sure you have it before you start making the salad because there is no replacement for it, sumac has its own distinct flavor and taste that I hope you will enjoy. Grill the chicken breast and cut it in small strips. Chop all the tomatoes, cucumbers, green peppers and onions in small cubes; throw them all to a large bowl. Add the cilantro, parsley and the finely chopped mint. In another bowl, whisk the olive oil, lemon, salt and pepper and sumac until it turns thick. To the large bowl, add the chicken and pour the dressing over everything. Toss well. This was sooooo good! I needed something light and cold because it’s mid summer in Phoenix arizona, food just doesn’t taste good. But this! Oh my word! I’m adding this to my go to for something flavorful and refreshing! I used grill mates mesquite for the chicken! Thank you! !